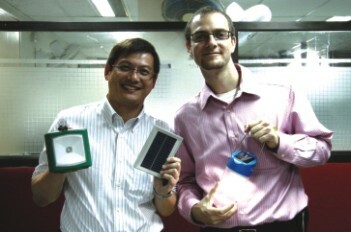 Sam Goldman (right) and one of his associates show samples of solar-powered devices. All great ideas are born in little bursts. 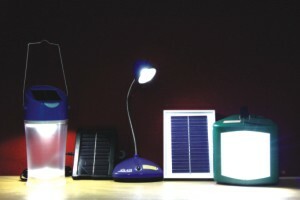 d.light, a US based company, which produces cheap solar lanterns, started as a student project at Stanford University. "The plan was to assess the energy needs of the developing countries," says Sam Goldman, founder and chief executive officer of the company. He had taken a special interest in the project, for which he had gone to remote villages in Myanmar; and there are reasons. Goldman is no stranger to working in the backwater. Before enrolling into the MBA classes at Stanford, he worked as a volunteer with the Peace Corps in Guinagourou, a village in the West African country of Benin. In fact, the idea of making solar lanterns dawned on him one summer night when, a kerosene lamp in hand, Goldman stepped onto something fleshy in his mud hut. "It was dark outside for the night was moonless," he says. By the time he found out that it was not a rope but a tree snake, the lamp slipped off his hand and Goldman was bitten by the snake. "There was no electricity in that area, so the dispensaries in Guinagourou didn't have the antidote that I needed to take. You have no idea how petrified I was," Goldman says. When his friends almost gave up hope, they found a dimly lit pharmacy, which had a diesel-run refrigerator. "They had only one shot left and the pharmacist told me that the last person who needed it didn't have the money to buy it," he says. Scary though the incident was, it taught him one valuable lesson: he must do something to get rid of this menace--not the snake, the kerosene lamp. Then another accident, which made him look for greener and renewable sources of energy, was more deadly in nature. A ten-year-old boy in the village was severely burnt. So when Ned Tozun, a Turkish-born American friend at Stanford, proposed that they could start their own company that would devote itself to solar table lamps and lanterns, Goldman was more than welcoming. The project won the Draper Fisher Jurvetson Venture Challenge 2007, which is run by a venture capitalist farm in the US. "A quarter million USD is a lot of money. We could now concentrate on d.light. Without the money, materialising the whole solar lantern dream, would have been difficult," Goldman says. One in every three villagers in the world use kerosene lamp and d.light, which Goldman and Tozun fondly named, took the world's villages by storm. By the end of 2010, 10 million people are going to use one d.light product or the other. There are three devices on the shelves now: Premium Solar Lantern, which has 4 brightness setting, can give up to 12 hours of light; Affordable Solar Lantern, which has 360-degree lighting, is weather-resistant; and the Quality Solar Task Lamp, which has a flexible gooseneck, can give up to 15 hours of light a day. With power outage becoming part and parcel of people's lives in Bangladesh, Goldman wants to market solar products in the country. But the barrier he and his award-winning company is facing is no less than uphill. And the hurdles are put mostly by the government. There are outrageous duties; Goldman says, "I think it's the highest in the world. These duties are no doubt the reason why tens of millions of Bangladeshis, both urban and village, will be forced to continue to use kerosene lanterns, candles, and other dangerous, non-renewable sources of energy." In India, most of the states do not impose VAT on d.light, and the duty is a meagre 10 percent. But in Bangladesh only solar panels are exempted from duties and there are customs and special duties, which are almost 50 percent of the product. As though to make it far beyond the means of the poor, the government slaps a VAT of 15 percent. Goldman thinks this duty structure is ridiculous and needs to be remodelled. There are hidden benefits of popularising the kerosene lantern, which our policymakers cannot afford to ignore. "We have seen around the world, and especially in India, that when families get better light, and a solar mobile charger, their incomes almost double, their savings (on kerosene) go up by 10-15 percent, children study much longer and get better marks, and quality of life improves dramatically," Goldman says.